Iran’s Supreme Leader honors "courageous" Iranian commanders who briefly detained 10 American soldiers last month. Iran’s Supreme Leader Ayatollah Ali Khamenei on Sunday gave out medals to Iranian Navy commanders who recently detained 10 American sailors in Persian Gulf, the Tasnim news agency reported. Navy Commander Rear Admiral Ali Fadavi and four other commanders who made a “courageous and timely” move in the recent capture of American boats and sailors near Iran’s Farsi Island were awarded by Khamenei with the 'Order of Fath' (Conquest), according to the report. The incident occurred in January 12, when Iranian forces captured 10 American Navy sailors who mistakenly entered Iranian territorial waters. The sailors were released within one day, but Iranian state media aired footage of the sailors' capture, angering U.S. politicians. Khamenei welcomed the incident, saying last week that detaining the 10 sailors was admirable, courageous, and faithful. “Your move was very excellent, interesting, and timely,” he said last Sunday, according to Tasnim. Iran claimed following the sailors’ release that they were freed following an apology from Washington, but the White House denied there was any apology to Iran for the incident. Khamenei giving medals to the soldiers is a reflection of his rhetoric against America, to which he refers as “the Great Satan”. Even after the nuclear deal with the West was signed and implemented, Iranian officials have continued this rhetoric. On Saturday, for example, a senior Iranian commander boasted that Iran has stepped up the process of boosting its missile capabilities despite American sanctions over Iran’s ballistic missile program. Iranian Defense Minister Hossein Dehqan said on January 18 that the Islamic Republic will unveil new domestically-designed and manufactured missiles in the near future in defiance of the new American sanctions. He was echoing an earlier statement by the country’s Foreign Ministry spokesperson, who said Tehran would continue building its controversial ballistic missile program. 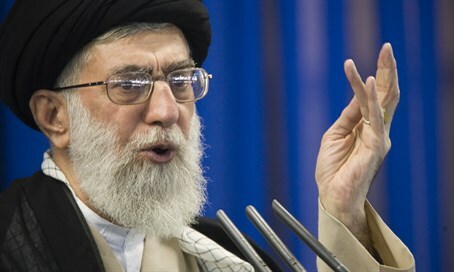 Khamenei has accused the United States of trying to “destroy” Islam. Recently he also accused the United States of using "money and sexual attractions" to wreak havoc on the Islamic Republic's way of life.